Between genetic hair loss conditions and the ill effects of daily living, the hair (and scalp) can take quite a beating. But whether you’re looking to prevent breakage and hair loss, or treat and reverse its effects, you may be interested to know that olive oil could be the answer you’re looking for. In this article I’m going to discuss the possible benefits of olive oil for hair growth. You’re going to learn about the scientific study carried out on oleuropein (which is found in olive oil) which showed it was more effective than the leading topical hair loss product at regrowing hair. You’ll also learn why these results likely occurred, and how you might be able to receive the same benefits. Commonly used in the culinary arts as a frying oil or salad dressing, olive oil is an oil obtained from the olive crop. This highly-valued tree crop, originating from the Mediterranean Basin, is made into oil through the process of pressing. Beyond its use in the kitchen, olive oil has made a name for itself in the cosmetics and homeopathic industries and has been used medicinally for thousands of years (1). From the banks of the Nile to the birthplace of democracy, olive oil has enjoyed a high status and widespread usage (2). And now, as more individuals are turning to natural and organic cures for their ills, olive oil is being celebrated as a miracle of sorts — from its ability to moisturize the scalp to its use as a hair growth stimulator (3). Olive oil is also one of the main ingredients in Wild Growth Hair Oil which you can learn more about here. 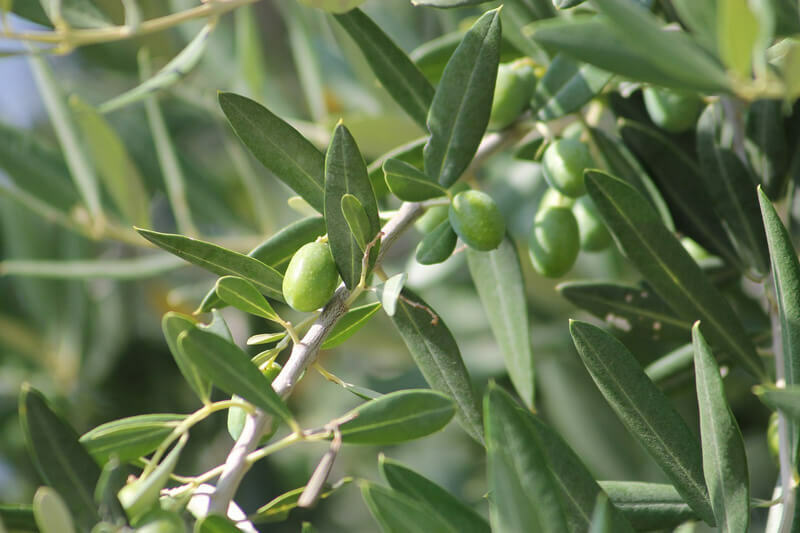 A recent study performed by Tong, Kim, and Park shows that oleuropein, a component found in the leaves of the olive tree, induces anagen hair growth in telogen mouse skin (4). But to understand the importance of this finding, it’s first required that you understand the hair growth cycle. 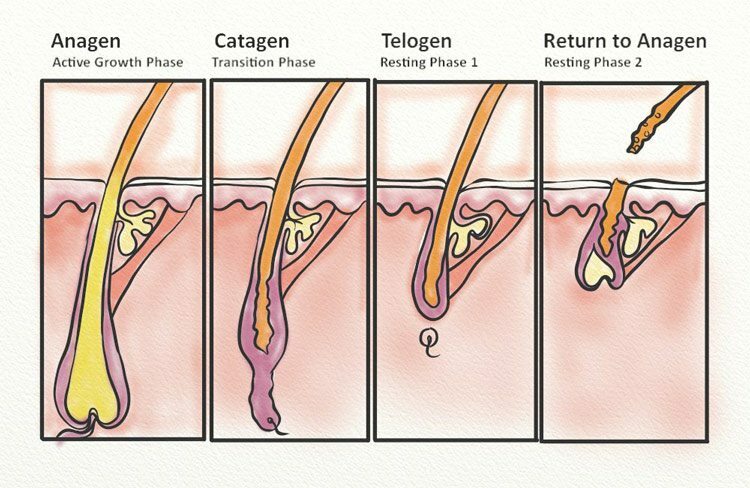 There are three phases within the hair growth cycle (5). Phase 1, Anagen – This is the phase of active growth and rapid cell division. Phase 2, Catagen – This phase is transitional and allows for the newly-grown hair sheath to properly attach to its root. Phase 3, Telogen – This phase is known as the resting phase, where shedding typically occurs. During this phase of the cycle, healthy individuals will lose 25 – 100 hairs per day, on average. In individuals who suffer from alopecia, the anagen phase of the hair growth cycle significantly shortens over time. As the length of the hair is proportional to the length of the anagen phase, the shorter the phase becomes, the shorter the hair which is produced. Eventually, those with alopecia are left with hair which is too short to poke through the hair follicle, leading to thinning and baldness. In this particular study, 24 mice were split into three groups of eight. The backs of the mice were shaved at 8 weeks of age, and the telogen phase of the hair growth cycle was confirmed. 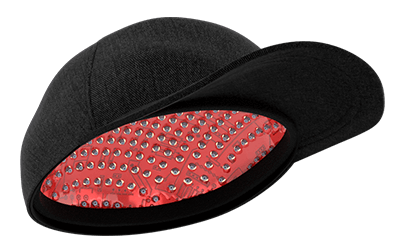 For 28 days, each mouse received a 200 μL application of either control, control plus 0.4mg concentration of oleuropein, or control plus 3mg concentration of minoxidil. The control consisted of 50 percent ethanol, 30 percent water, and 20 percent propylene glycol. The mice were photographed on days 0, 7, 14, 21, and 28, and 10 random hairs from each mouse were measured on the same schedule. A comparison of hair growth in mice being treated with either A. a control; B. oleuropein; or C. minoxidil. Source. 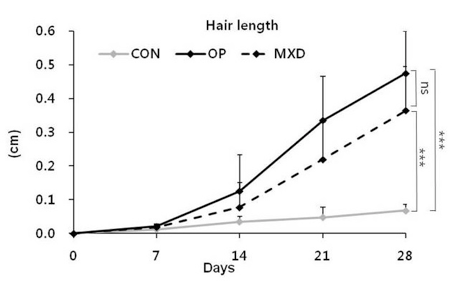 A comparison of the hair length (in cm) of mice treated with a control, oleuropein, or minoxidil. Source. Now, it’s no surprise that the hairs in the oleuropein-treated group were longer than those in the control group. However, it is surprising that the oleuropein-treated group also had better results than the mice in the minoxidil-treated group. What caused such drastic results? At the end of the 28-day study, skin samples of the mice were examined. In the oleuropein-treated group, the mice had a significant increase in the mRNA levels of four separate growth factors (insulin-like growth factor – 1, hepatocyte growth factor, vascular endothelial growth factor, and keratocyte growth factor). In fact, compared to mice treated with only the control, the mice in the oleuropein-treated group saw a 71 percent increase in dermal IGF-1 levels. Each of the mentioned growth factors plays their own role in the growth and development of hair follicles. IGF-1, for example, is known to regulate cell proliferation which occurs rapidly during hair follicle formation (6). There’s no doubt that the upregulation of growth factor gene expression played a significant role in the study’s results, but there’s another reason that treatment for hair growth proved to be so effective in the oleuropein-treated group of mice. In a 2010 research study published in Developmental Cell, it was discovered that deletion of the β-catenin gene in dermal papilla cells of fully developed hair follicles led to the premature induction of the catagen phase in mice (7). Further, the Wnt10b/β-catenin signaling pathway seems to play a role in the maintenance of the anagen phase. In the oleuropein-treated group of mice mentioned in the previous study, researchers found that not only was there an increase in the mRNA levels of different growth factors, but oleuropein also led to the modulation of the Wnt10b/β-catenin pathway. This pathway, proven to prolong the anagen phase, is largely responsible for the significant hair growth seen in the mice (8). Certain forms of alopecia are caused by inflammation of the scalp. This inflammation can be caused by a weakened immune system, allergies, or any other number of circumstances (9). Whatever the source of the inflammation, the fact remains that chronic inflammation can be damaging to the hair follicles and induce premature hair thinning and loss (10). As was shown in a 2008 randomized trial, the daily ingestion of virgin olive oil led to a decrease in circulating concentrations of interleukin-6, a known pro-inflammatory, and C-reactive protein, a responsive protein that indicates inflammation within the body (11, 12, 13). But what makes olive oil such a powerful treatment option for inflammation, and are these results external as well as internal? Oleocanthal, a phenolic compound within virgin olive oil, seems to be the underlying reason for olive oil’s effective treatment of inflammation and inflammatory diseases (14). Phenolic compounds can be found within a number of plant-based foods, such as chili peppers, oregano, and sesame seeds. Oleocanthal, however, is unique to virgin olive oil, and its various components are present within its very name (oleo – olive; canth – sting; and al – aldehyde). 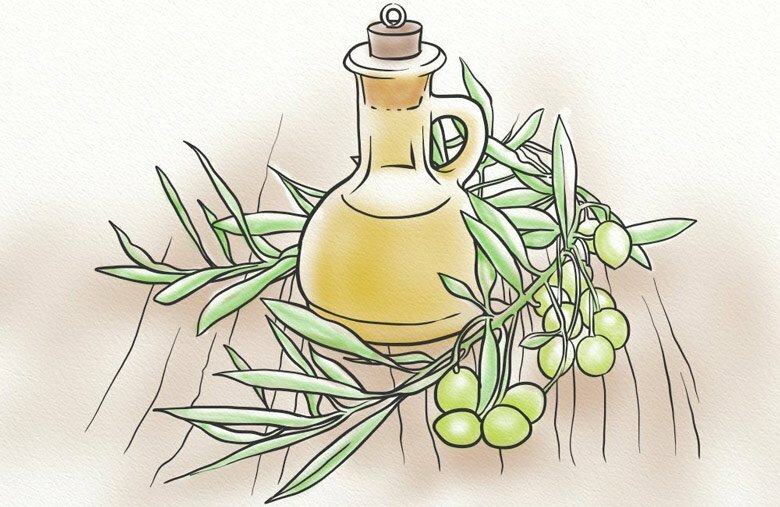 This unique compound is responsible for the irritating sensation felt by most individuals in the back of the throat when olive oil is directly consumed. Interestingly, this very attribute is believed to be felt most strongly in individuals who are particularly sensitive to the positive effects of oleocanthal. And, while this phenolic compound is structurally dissimilar to Ibuprofen, the non-steroidal anti-inflammatory drug, both compounds inhibit the very same enzymes in the prostaglandin-biosynthesis pathway which triggers inflammation (15). As a natural inhibitor of cyclooxygenase enzymes, there’s no wonder that oleocanthal plays such a large role in the reduction of inflammation. Does this mean that the use of olive oil can reduce inflammation of the scalp for individuals with alopecia? As previously discussed, oleocanthal reduces the circulating concentrations of interleukin-6 and other inflammation-causing enzymes. This means that the anti-inflammatory effects are seen throughout the body, which makes oleocanthal a viable option for individuals looking to reduce scalp inflammation and irritation. Olive oil is a commonly ingested oil, and ingestion of 2 tablespoons per day can be tolerated in those looking to supplement, though up to 1 liter per week has been safely used as part of the Mediterranean diet. Are There Side Effects Associated with Olive Oil Supplementation? While side effects associated with olive oil supplementation are few and far between, there are those individuals who may need to consult with their doctor prior to supplementation. Such individuals include those with diabetes, low blood pressure, and those currently taking high blood pressure medications. 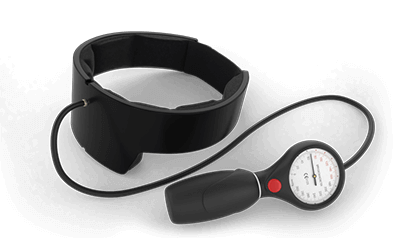 The consumption of olive oil can lower both blood sugar and blood pressure, and even with the consent of your physician, individuals with diabetes or low blood pressure should monitor their levels closely (16, 17). Contact dermatitis, or an allergic skin reaction, is rare. However, those with allergies may develop a skin rash similar to eczema and should cease supplementation immediately (18). As always, women who are pregnant or nursing should consult with their obstetrician to ensure the safety of supplementation. Is Olive Oil the Treatment You’re Looking For? There are a few studies which suggest olive oil may play a role in hair and scalp health, and possibly even promote hair growth. But does this mean that olive oil is the right treatment for you? Olive oil supplementation may certainly have its benefits, but it’s very unlikely to treat your hair loss condition by itself. To do this, you’ll need to fix the underlying cause of your thinning and loss. Only once you’re addressing the problem head on can you see favorable results from such treatments as olive oil. That’s pretty incredible to see that oleuropein beats minoxidil in a controlled study. I’m still not sure about using it directly on my scalp though, it could get a bit messy. Yes it can get messy. I would suggest trying a mixture of magnesium oil and peppermint oil instead. Hey olive oil is effective on the scalp but only a touch of it. I mean take a qtip and rub it lightly throughout scalp, if it makes you greasy…too much. Notice how good olive oil works on brows. Good to see it tested and proven. Any will do, I used cheap grocery store brand, it’s helpful for sure, just not a lot or adversely it causes hair to fall out,at least for me.